The point of marketing automation systems, like Marketo, is to automate communication throughout the customer lifecycle. When utilized correctly, Marketo can be a major asset for marketing and sales. One of the biggest challenges Marketo admins face when trying to automate communication is bad data. Duplicates, nonstandard data, incomplete data, and inaccurate data wreak havoc on marketing campaigns every second. By identifying the ways bad data can enter your Marketo system, and understanding the effects it has on your database, you can manage your marketing automation system in a more efficient manner. This process will help save you thousands of dollars on Marketo record costs, and increase overall efficiency in all of your campaigns. The first step to cleansing Marketo data starts with creating a smartlist to identify records with no email addresses in Marketo. Sometimes Salesforce and other systems can sync data into Marketo with no email. Records are pretty much worthless in Marketo if they have no email address. Feel free to purge these records from Marketo and leave them in your CRM. If you leave the records in your CRM, have Marketo tech support create a sync filter that prevents records without an email address from syncing to Marketo. Use the Marketo Email Invalid field (true/false). Create a smart list to identify records that have hard bounced. Any email that has been set to true in this smart list is a hard bounce. If you want to prevent these records from being synced back into Marketo, Marketo tech support will need to create a more sophisticated sync filter. Use an email validation provider like RingLead to identify spam traps & invalid emails. Create a smart campaign that sets the Email Invalid field to true. Create a checkbox field in CRM for sales reps to select when they find that someone is no longer at the company. You can remove these records when appropriate. (Send a report of these records to RingLead to reconnect and find new contact information). Use the Marketo system smart list Unsubscribed People. Customers may unsubscribe from your promos, but they may receive operational emails. If prospects opt out, you may remove them from Marketo, or continue to monitor their page visits to your website and other digital activity. You may even want to create a smart campaign that when they submit another form, it changes their unsubscribe field value to false. 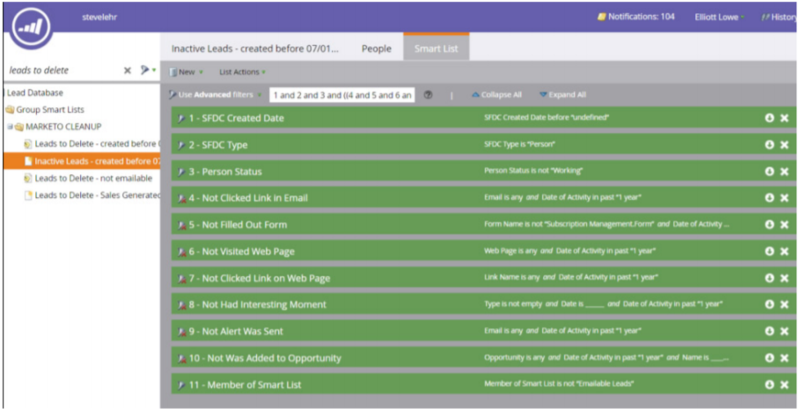 Create a Spam Bounced Count score field in Marketo. Then create a smart list that increments the Spam Bounced Count field every time a Category 1 (spam) bounce occurs. If records have a spam bounce more than a couple times in a row, consider removing them. Create a smart list that selects records that have not engaged in a long time as illustrated in the screenshot. You may want to send a “wake up” email and remove 7 any records that do not respond. Are the behavioral scores of your records negative or 0? This is similar to step 7, but you may find outliers. Records that engaged years prior but over the years their scores have fallen off. If you work through these 10 steps to remove bad data from Marketo, you should be able to reduce storage by 30-40%. This will speed up your Marketo instance, save money on storage, and increase efficiency & reporting of every campaign. After cleansing your Marketo data, you should analyze it to identify ideal customer profiles. Then rebuild with clean data that matches your account and contact ICP. You may feel overwhelmed with all of this new information, but, RingLead Data Management Solutions (DMS), is here to help. 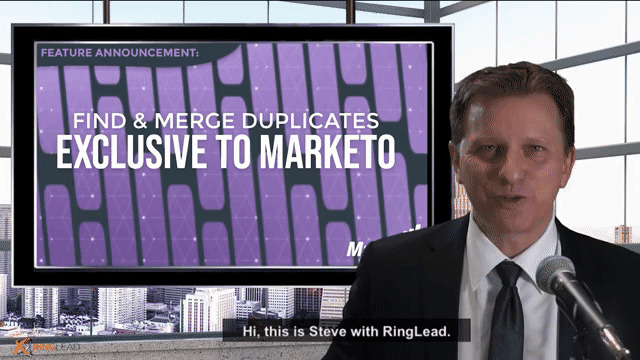 RingLead DMS can clean out and prevent duplicates from entering your marketing automation system in real time! You can even schedule cleanse and deduplication to run hourly, daily, weekly or monthly, and have a full report emailed to you so you know exactly how many duplicates were merged. RingLead DMS is an effortless way to manage the bad data in your database. Not sure just how many duplicates are in your database? Get a FREE data analysis of your Marketo system today by clicking the box below!